Ever since I can remember, I’ve owned a Zebra Finch. When I was about 3 years old, my parents bought a pair of finches and I named them Hoppity-Hop and Jane. Jane died after 2 years, but Hoppy (named him that because of what he was doing in the box on the way home from the pet shop) lived until he was approximately 10 years old! 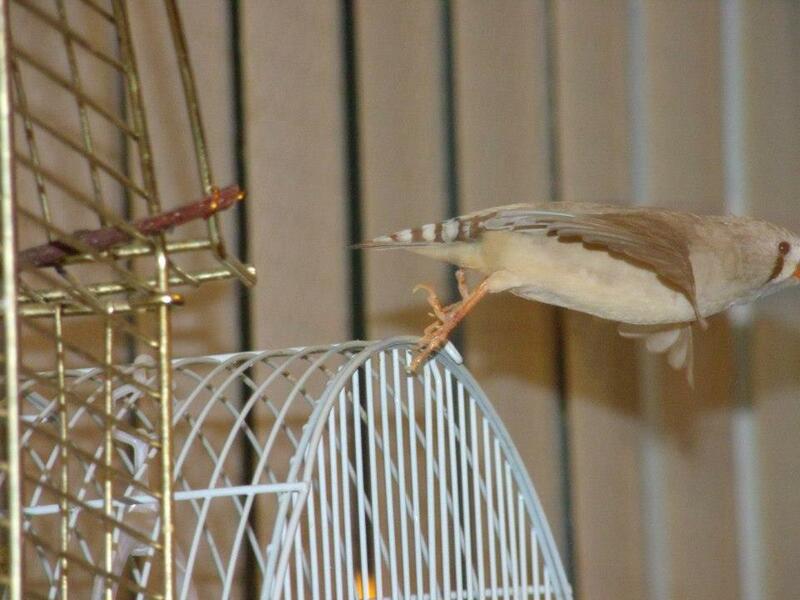 Zebra finches are an ideal choice for a first pet. This post will introduce you to the zebra finch, and will hopefully shed some light on some questions that a lot of people have asked me. The Zebra Finch, native to Central Australia, are one of the most popular birds in the area. Some people call them “flying mice” because they breed so easily, and can have four or five broods per year. The zebra finch is roughly 3 and a half inches in length, from the tip of the beak to the very tip of the tail. Both male and female are the same size. Colours can vary tremendously through imbreeding, and mutations, although I’ll stick with the most common variety. Both male and female have a dark grey back, top of the head and wings. There is, however, quite a lot of difference between sexes, so it is very easily to tell them apart. The male has a white under-carriage and lower chest, has white-speckled brown feathers to the sides and under his wings, has a black bar running straight across his chest, black and white striped feathers on his upper chest, a black “tear-drop”, and burnt orange coloured cheeks. His beak and legs should be a bright orange colour. The female is dark grey with a paler grey belly and chest, but still has the distinctive “tear-drop”. You may also notice that her beak and legs are a much more subtle orange, and is a lot paler than the male. 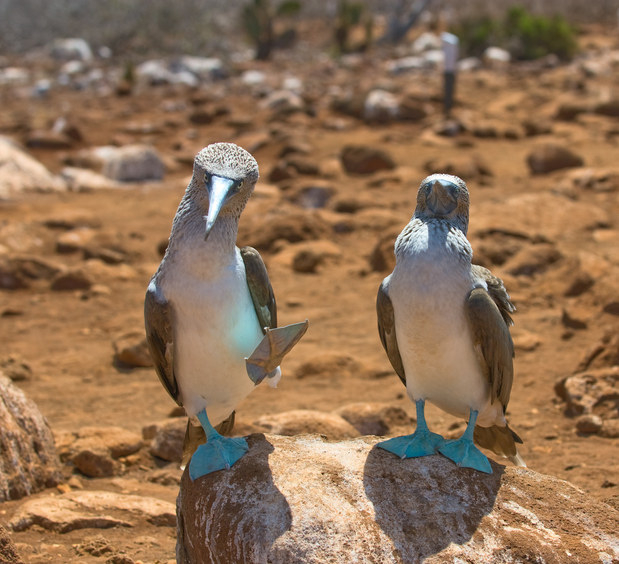 Both birds have a tail which measures approximately 1 inch in length. This is where the finch gets it’s name from. The tail is black with white stripes all the way across. The zebra finch’s song is made up of a variety of “eeps” and “beeps”. Both sexes of the birds make these noises, but the female can make a “rasping” noise when in breeding season, and she is defending her territory and eggs. The male’s song is quite distinctive, with a variety of high and low pitches and different lengths of “eeps” and “beeps” put together in order to attract a mate. With every living creature, food is the most important thing. Finches live mostly of small seeds. This is made available in forms of millet sprays, and “loose”. The zebra finches which I own now are partial to fresh bread, sliced cucumber, crushed lettuce and a slice of apple. It is also very important that you supply fresh water on a daily basis, and change it at least twice a day. Drinking water can be supplied in a sealed tube with a little “saucer” opening, or in a metal container. This breed is also a very clean bird. It is important that you can supply water in which the bird can bathe in. Another couple of options are available here… A cage bath can be bought from any pet shop OR you can place a small saucer filled with no deeper than an inch of fresh water for the bird to splash around in. Trust me, your finch will love you for it. Now this is the part where everything gets a little tricky… I’m not going too deep into the breeding part of my review, as I believe that unless you know what you are doing, you shouldn’t breed your birds. It’s unfair (if you don’t have a plan of what you’re going to do with the babies once their ready), and a breeding female can die prematurely. You can always tell when a pair of zebra finches are ready to breed. You will notice that the male will be carrying round random feathers, and anything suitable to build a nest with. He will try to build a nest anywhere suitable, on a stable surface (even in the corner of the bottom of the cage). If you are going to breed your birds, this is the time to buy a finch breeding box. There are plenty of options available for you to buy from the pet shop, but there are two which are most suited, and both of these boxes have a “roof” and a small hole for the bird to get in and out of easily. The first is a basic straw nest, which costs roughly £3 – £3.99. The second option, which is by far the best, is the natural material nest. It looks like a type of scraggy material, and these can cost anywhere from £3.99 – £7.99. Offer plenty of items and materials that your birds can use to stuff the nest. Offer cut up toilet tissue, cut up kitchen roll, leaves and even (ONLY IF IT’S CLEAN) a cut up head off a hand-held washing up mop. All nesting material must be dry and clean. PLEASE NOTE: When I first bred zebra finches, I bought some ‘natural nesting’ material from a pet shop. This was soft, but stringy. My finches laid 6 eggs, 4 of which hatched. One of the babies died when the nesting material wrapped around it’s neck, another baby lost its’ leg with the same situation, and a third baby AND the father (Hoppy, who I mentioned earlier) both lost a toe. Usually after the nest is finished being built, the female will then make a slightly different song. It may sound as though she is “crying”, but it’s more of a ‘relieved’ noise that she is making. The female will lay anywhere between 4 – 12 eggs. Usually when there are 3 or more eggs, the incubation period begins. Both male and female will take it in turns to sit on the eggs. Incubation can take anywhere from 18 to 25 days, usually hatching in order in which the eggs were laid. Unless you are intrusive, you will not know when the eggs have hatched, because the babies do not gain their voices until they are roughly 1 week old. Even then you may have to listen very carefully, because they “eep” so quietly, and only when they need feeding. It is at this time when you need to supply as much fresh bread and salads as possible. A nice little trick I’ve learned is if you hard boil an egg (not one of your finches ones, a chicken / duck one!) and then crush it all down (INCLUDING THE SHELL) and then offer it on a small saucer in the bottom of the cage. It may sound cannibalistic, but the female zebra finch needs this to keep calcium in her body, and to keep her strength up. Usually after about 3 weeks, you will start to notice that the babies are eager to venture out of their nest. Your babies are no longer babies, and are called fledglings. Do not remove the nest once your fledglings have ventured out. They will still return to the nest of a night time, and whenever they feel threatened or afraid. You will usually be able to tell the sexes at approximately 2 months old. The fledglings are no longer babies, and are starting to mature. “Teenagers” if you like. You should now remove the nest. When the babies are 2 and a half months old, this is the time when you need to know what you are doing with them. If you are taking them to a pet shop; if you are giving them to a family member or friend; if you are keeping the babies yourself; get another cage sorted out, and DO THIS NOW. You must separate the young from the parents as territorial fights now begin, and this can, and usually is, very brutal and can lead to death. PLEASE NOTE: Please take the nest out now if you have not done it already… You must give your “parent” birds time to recover, or if they continue to breed now, the female will die prematurely of exhaustion. Overall, Zebra Finches can be fantastic company. They are not, however, as sociable as a budgie, but they can look after themselves! Just make sure that you supply fresh food and water daily, and allow the birds to have plenty of light (not direct sunlight). They can be sociable, and love to chatter to you, so give them an hour to speak to you… For the best interest of your birds, if the weather is calm, sunny and warm (NOT HOT), put the cage in the garden so the birds can get some fresh air. If the day is stuffy, but has a breeze, keep the birds indoors, but open the window SLIGHTLY. I hope that I don’t need to explain to you that in extreme cases like thunder and lightening, the birds should be kept inside, and preferably, cover the cage up with a large towel so the birds cannot see the flashing. Watching the behavioural habits of these birds is just amazing. You can get “friendly” birds who want you to hold them, and they want to “preen” your hair, and you can get the “grumpy” ones, who do want to talk to you, but they don’t want your hands anywhere near them. Don’t force the bird to do anything it doesn’t want to. If it wants to come to you, it will in its’ own time.